If you are looking for a lighthearted story that is punctuated by the music of ABBA, then Mamma Mia is your ticket. It’s a cheesy, spandex-driven musical that will make you want to get out of your seat and start dancing. That was the scene at Keller Auditorium, when I attended Mamma Mia on Tuesday evening (August 23), which was the first night of its weeklong run in Portland as part of its North American tour. Perhaps there is no way to explain the enduring popularity of ABBA’s music, which sold in the millions when the Swedish pop group was one of the hottest acts on the planet forty years ago. But the success of the musical, which has been playing in London since 1999, has inspired productions all over the world and a hit film version in 2008. So it is no wonder that the audience (which was predominately female) loved every second of ABBA standards like “Dancing Queen,” “Super Trouper,” “Knowing Me, Knowing You,” and “SOS.” All that was missing was a disco ball. The musical is set on a Greek island, where a young woman is preparing to get married. She would like to be given away by her father, but she doesn’t know who her real father is. After she finds one of her mother’s old diaries, she discovers that her mother’s dalliances with three men many years ago probably means that one of them is her father. She then invites the three men to her wedding, and they actually show up. Tensions flare and a lot of dodging, singing, and dancing goes on before the final outcome. The volume of the show on Tuesday night was turned up so high that the sound became slightly distorted at the beginning of the show. The sound crew might have been trying too hard to overcompensate for the vastness of Keller Auditorium, or they might have been trying to aid the voice of Kaye Tuckerman, who had a tough time projecting her lower range but did well in all other aspects as the mother. Chloe Tucker outstandingly conveyed the wishful naiveté of the young bride to be. The show was almost stolen by Mary Callanan as the mother’s overweight friend. Alison Ewing as the mother’s surgically-enhanced friend was also superb. The prospective fathers were expertly portrayed by Jeff Applegate, Paul De Boy, and John-Michael Zuerlen. The exceptional comic timing, energetic dancing, and over-the-top pantomiming (while dancing and singing) made Mamma Mia delightful. But the touring version relied too heavily on one set, which depicted the outside of a hotel and courtyard (and later the nave of a church). Another set would have been refreshing. 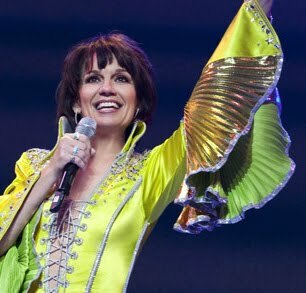 Although the entire audience was standing and cheering at the end of the show, the bonus finale that included glitzy ABBA-inspired costumes raised the rooftop with singing from all corners. That was a great way to end the evening. There may be some tickets left for the remaining performances of Mamma Mia on Saturday (August 27) and Sunday (August 28). Contact Broadway Across America. Since Erwin Schrott and Oregon Symphony conductor Carlos Kalmar are natives of Montevideo Uruguay, it might be possible for Kalmar to appeal to his fellow countryman for an appearance with the Oregon Symphony. Of course, that would mean a duet opportunity for Schrott and his wife Anna Netrebko. Well, it's a long, long shot, but you have to start somewhere. An interview with Bobby Ray of The Electric Opera Company proved most enlightening! I'll be at their show with CRPDX at the Alberta Rose Theatre tomorrow night. I guarantee you won't have more of a blast anywhere in the 503 for 8 bucks on Friday. I reviewed Hideki Yamaya's latest CD: a recording of Roncalli's Capricci Armonici sopra la Chitarra Spagnola for baroque guitar. Hideki is one of my very favorite solo baroque stylists in a city that is absolutely crazy for early music, boasting many top-notch performers. Simply put, this CD is marvelous. Click on the links above for the articles and further linkage. Theater on August 19th for a concert that won’t soon be forgotten. whatever you want, its classical music for the 21st century! Classical Revolution PDX offers chamber music performances in highly accessible venues, such as bars and cafes. By taking chamber music out of the recital hall and making it more accessible to an audience who does not otherwise hear such music in a live context, Classical Revolution strives to make the public aware that classical music is still relevant and can be enjoyed by all. the gospel of classical music to the unsuspecting. Who: Produced by Electric Opera Company and Classical Revolution PDX.